There are plenty of deck designs you can take inspiration from when you’re looking for deck ideas. Decking is much more versatile than many people think it goes beyond just plain wood and plastic decking. Outdoor decking can actually take many forms and I’ll be taking a look at the four main types in this article. When you think of decking ideas you likely think of softwood boards, these are the most common type of wooden decking and arguably the easiest type to install. But just because they are the most popular that doesn’t mean they are the best decking material does it? Apart from being easy to install softwood decking is relatively inexpensive in most forms, widely available and it is versatile enough for various types of deck designs. So, there are plenty of positives to this classic outdoor decking. But there are some downsides as well the main issue with softwood decking is that it requires a lot of maintenance and it can easily warp and get damaged if not looked after. It can also become slippery due to algae growth on the surface. GripDeck non slip decking inserts help to make the decking non slip all year round. Another popular decking idea hardwood is often considered the most beautiful kind of decking but that beauty can be very expensive to obtain. Hardwood boards are sourced from tropical trees and this makes them tougher. 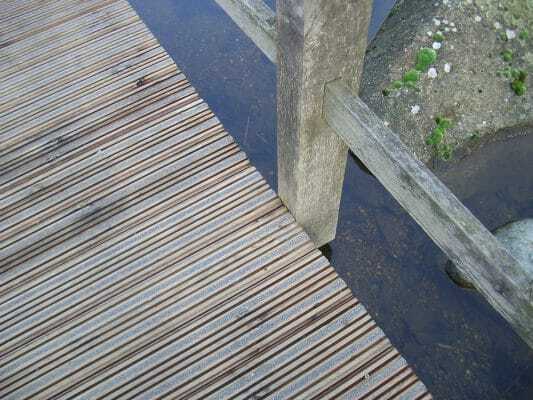 Therefore they won’t require the regular maintenance of softwood decking. They are also naturally resistant to issues like warping, splitting and wood rot. While this outdoor decking might be strong and beautiful the price can put people off. But it isn’t just the expense hardwood decking is also often more difficult to install (although this will depend on your decking design) and it is not the most eco-friendly choice available either. It is also important to know that just because hardwood decking is tougher and more resistant it will still require maintenance every so often. If you are looking for more modern deck ideas then composite boards are what you need. These boards are made from a mixture of materials including wood-flour and plastics. Composite boards are ideal if you are looking for strong non-slip decking and they come in numerous different colours and designs. Composite decking is a good choice if you want outdoor decking that is low maintenance. The decking is usually resistant to issues like moisture and mould and very easy to install. However, there are some negatives to consider because composite decking is usually very expensive and it is not the most eco-friendly choice either. Plastic decking is becoming a popular choice for people looking for professional high-quality outdoor decking! If you want a patio deck that looks a little different and stands out then plastic decking is a fine choice and it is available in numerous different designs and colours. There are also plenty of benefits to using plastic decking as well it is not only easy to install in most cases but it also very low maintenance. Plastic decking is tougher and more resistant to damage. There are plenty of benefits to this more unusual outdoor decking but it does have one big drawback and that is the price. Plastic decking can be very expensive especially if you want a more unusual colour or design. You might not like the end result either as plastic decking can look too artificial for some people when compared to the more classic and traditional look of wood decking. It is also not the best choice if you want to be eco-friendly either. GripDeck does not currently sell PVC Decking. So, that is a look at four very distinct deck ideas. Whatever you’re looking for there is sure to be a decking type for you.